The bug man is supposed to be coming to my humble abode to bug-bomb the crap out of the spiders who decided to take up residence. I found a web across my shirts hanging in my closet—and the shirts I wear all the time, not the ones in the dark back corner. If you know me, you know how creeeeeeeped out I got. Right after that we made an appointment with The Bug Man and I've been looking forward to this day. To see the complete, unabridged version of my photos from the city by the bay head over to Photo by Geri and check them out! Anyways.........Op! Was that the doorbell?? Gotta run folks, before I get gassed! worst thing out there. i don't care how small they are or how harmless they seem they are my enemy. once i had one crawl across my neck while i was in bed, yeah in my bed, with my computer. worst experience ever. hope your bug guy gets them all. Spiders...creepy. Hopefully there's not a lot of them roaming around! 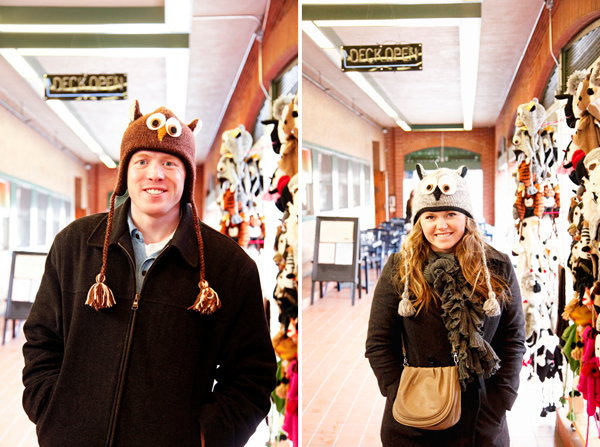 Love the owl hats! Too cute! Loooove those hats!! And boo on bugs! I am not sure if everyone quite understands your ture hatred for spiders?? You forgot to mention you cant even watch Charolettes Web! I hope all those little suckers are lickity split! Ewhhhh remember that one on your blinds right behind our heads?? adorable photos! and yes those hats are fantastic. i hate how hard it is to get pictures together on trips (when it's just the two of you). P.S. I absolutely love your blog!